The purpose of this event is to bring different firms and companies to our College of Architecture, Planning, and Public Affairs building and connect CAPPA students with possible job opportunities, part-time and full-time, considering all CAPPA disciplines including architecture, interior design, planning, and landscape architecture. 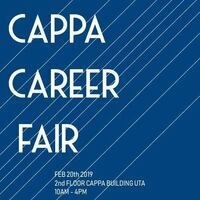 We are proud to collaborate for the first time with all the student organizations at CAPPA to host the CAPPA Career Fair and make a note that this previously exclusive AIAS event now includes IIDA, SPA, SASLA, and CSC. As it is a student-run event, all funds raised will go to these organizations to help provide funding for guest speakers, general organization meetings, and other events to enrich the CAPPA's student (and future professional) experience at UTA.